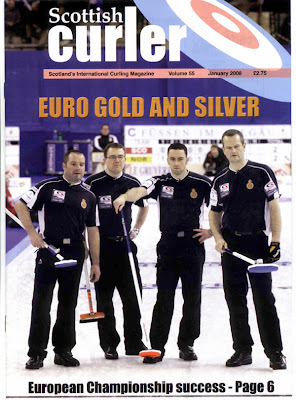 Here it is, the January Scottish Curler magazine, now in the mail to subscribers. Have you got a subscription? If not, you can download the subscription form here! Please support Scotland's independent curling magazine. What's in this month's magazine? The main story of course is the success of the Scottish teams at the European Championships, and there are some great photographs by Richard Gray of the event. The Editor gets interviewed by Maryel - now that is revealing! Copey speaks out with his usual humour in Behind the Glass with his comments on 'The Great B Road Stooshie', amongst other things. John Minnaar speculates on how much it should cost to build a four sheet curling rink. Broomhall CC is Club of the Month and David B Smith illustrates the riches to be found in dusty volumes in The Historical Bit. And Gordie Kennedy suggests ways that the Royal Club needs to change for the better! Plus the regular Curling World, Looking Back, iCurl, Rock Rules, Sweepings and The Extra End features. Lots to read and enjoy. I hope you will.... read and enjoy it, that is!